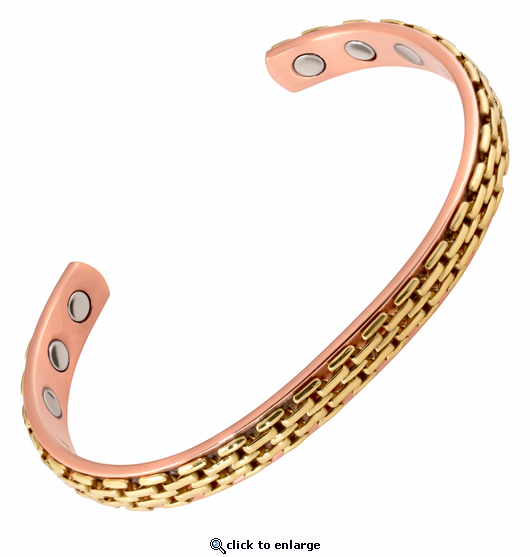 This is a finely crafted solid copper therapy magnetic bracelet. Styled in brass basket weave it is made from only solid metals and no color plating. It has 6 powerful 3000 gauss neodymium rare earth bio north facing magnets and stainless steel magnet caps for added durability. This nickel free solid copper magnetic bracelet is about 1/3" wide. I love this.. it is really pretty and strong.. it fit great and after just a few hours the pain in my fingers is much less. I highly recommend this product and the company. It came quickly and nicely wrapped (protected) from getting banged up or scratched up. The quality of this bracelet is outstanding. It is very comfortable. I am happy that your company offers size ranges so customers can get a proper fitting for the bracelet that is being ordered. The size offerings is a great help for a good fit. Bought it for my husband and he absolutely loved it. Really beautifully done! Bought it for my husband due to his other one was too small and this one fit him perfect. He loves it. This is the second type of bracelet that I bought and I have been very pleased and told some of my family and friends about it. Nice, attractive , good fit, fast shipping. I love it , Fast Delivery Too ! I ordered this for my husband. The copper bracelets he had before were all too small. This one fit perfectly and he loved the design and weight of it. It shipped promptly and arrived in perfect shape. I am very satisfied with the bracelet and the way the shipping was handled.